The last two decades of the 20th century witnessed a veritable explosion of Holocaust scholarship. We have endowed university chairs devoted to Holocaust studies, and museums and monuments to the Shoah bloom. Yet the public at large is no closer to an understanding of those momentous events today than we were two generations ago. Now comes a book that can at least partly remedy that situation. Editor Laqueur, a notable Holocaust historian (Generation Exodus, Forecasts, Feb. 19), has done a masterful job of bringing together more than 100 contributors from nearly a dozen countries, including such leading scholars in their fields as James Young, Stanley Payne, Michael R. Marrus, Raul Hilberg, Israel Gutman, Saul Friendl nder, David Cesarani, Daniel Carpi and Christopher Browning. The result is a comprehensive one is tempted to say exhaustive, but the subject can never be exhausted volume. Of particular value are a 17-page chronology of events; the bibliographical essay by Robert Rozett, director of the Yad Vashem Library in Jerusalem; and Adam Kaczkowski's haunting and powerful photographs. These are joined by approximately 250 illustrations that cover all aspects of the Nazi extermination program but also offer intimate portraits of the culture of Jewish life in Nazi-occupied Europe. Entries range in length from a few sentences to a dozen pages on Hitler, anti-Semitism and Auschwitz. Laqueur asks, ""Is it possible now, more than fifty years after the Holocaust, to write about it with authority?"" The encyclopedia itself is authoritative, and Laqueur argues that ""it is most unlikely... that any future revelations will necessitate a radical revision of the present picture."" Finally, Laqueur is eloquent and humble in acknowledging the epistemological shortcomings of this (or any) work on the subject: ""Documents cannot possibly tell the full story; they do not smell, they do not starve or freeze, they are not afraid."" But this is no ordinary reference work; in it we can indeed see and even smell the horrors of the Final Solution, and yes, we are afraid. (Apr. 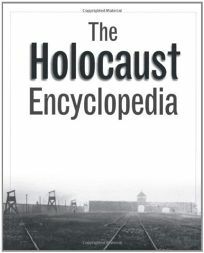 19) Forecast: There will undoubtedly be much media attention paid to this momentous book, aided by its publication on Holocaust Remembrance Day.